I am probably gonna do a lot of posts about music but today I was walking in the underground and, as I am doing since the 1st of January, I was listening to “All too well” by Taylor Swift. I don’t wanna get lost talking about 2014, because it’s been pretty sh–I mean rough and right now I wanna focus more about how.. this song helped me to get through these past months. And no, I am not gonna talk about how people criticise one of the best songwriter that we have at the moment, because everybody need to think whatever they want, BUT I will talk to them too. You should, not even listen, read the lyrics of this song and then let me know if you really think that you can’t see yourself in the story of this song. Anyway, let’s start with the post, shall we? I went to Taylor’s concert the 10th February, and even if I was really far from the stage that I couldn’t even see her, it was one of the best concert ever. And when she sung this song, god, everybody was feeling what she was feeling: anger, sadness, acceptance that she couldn’t forget that person. Yeah, practically the stages of grief. You will probably be confused now. Or you’ll think, c’mon girl, you are so sad. Well, keep reading please, I’ll explain you with the lyrics why I love this song. If you ever been with someone you know what this means. Everytime you are with that person, you feel good about yourself, you feel strong, and especially if you are far from home, you feel like you are not alone. After a while, months, that you are not with someone, the hope is gone, you have to be strong and move on. But, at the beginning, you’ll find yourself to think that you are okay, but at the end of the day, you’ll know, that you just lied to yourself. That’s one of the worst feelings. When someone makes you believe that he\she actually wanna be with you, in the next months, in the next year but then everything just end. Without a reason and you feel like did they tell you a lie? did they really mean what they said? Well if you had the answers, you are lucky. One bad thing that happens, when you were making plans about what you wanted to be or what you wanted to do, that in the moment you lose the person that you wanted to do all the things with, you are just numb. And when you try to forget that person, you start to forget yourself too. You don’t remember who you are, who can you trust, what do you really want and need. “‘Cause there we are again in the middle of the night. This is the bridge of the song, in fact I love it, it’s just the moment when you are pissed off with that person, because it’s just tore you apart and you think that you will never forget that you will never get over it. You think that it’s your fault if it ended, even if you didn’t do anything. You’ll blame yourself for a lot of things. Just because while you are in pieces, that person seems perfectly fine. I am just looking at the screen of my MacBook now, thinking about the perfect words to explain this part of the song but.. the fact is that I am still trying to find my old self again. This is me now. Just looking at my screen and writing what I think you all should do. Don’t make my mistake. As much as you wanna close yourself alone and don’t trust anybody. Don’t do it. You will lose a lot of moments and friendship. Just stay close to the one that really loves you. Don’t tell me that you need to get over it by yourself, that you need to be strong. Because no one is, really, fully strong. I think that everybody reacts in different ways, it’s not the end of the world, there are things that are worst than this. Trust me, I know. I am just saying, you’ll see who’s really your friend when you need them the most. Oh, this. I remember..all too well. This part of the song made me cry for ages. Because it was actually real for me. Too real. And I remember actually that my mind, at some point, was shutting out this part of the song. It was way too much. Advice: you should listen all the song. Live. And read all the lyrics. 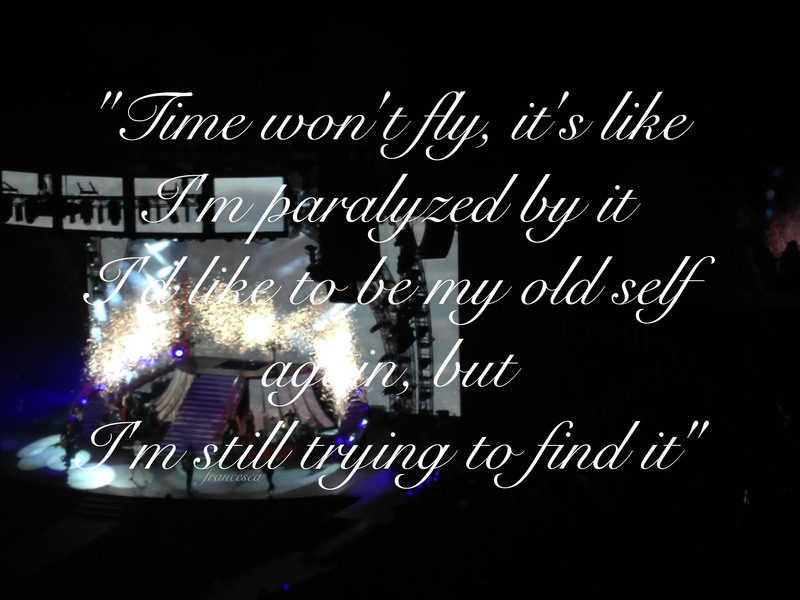 I fell in love with “All too well” more after the concert, just because of the speech before she sung it. The day after, I’ve actually looked for any videos from the night before, only for this song. I needed that speech. And I’ve found a video, and after I’ve listened it for a few times, I’ve decided to write it down. I remember that all the 02 arena was just so silent when she was talking, and we all had chills at the end. If you are living something like this now, it means that THAT person, it’s not worth it. You’ll find someone better. If there is something that I say to myself since I was a child (no is not “you are gonna meet prince charming”) I think that everybody is destined to be with somebody sooner or later.